Is personalized medicine--what some scientists call genetic medicine--a pipe dream or a panacea? Francis Collins, current director of the National Institutes of Health and director of the Human Genome Project, considers this new era "the greatest revolution since Leonardo," while Nobel Laureate Leland Hartwell compares personalized medicine to a train that has not yet left the station--"a very slow train with a very long way to go . . . before we arrive at our destination." There is no denying that new technology, which has triggered an explosion of scientific information, is ushering in a revolution in medicine--for specialists, general practitioners and the public. Anyone can spit in a cup and, for a small fee, learn about his or her individual genetic make-up. But how useful is this information, really, to us or to our doctors? What's more, how much do we truly want to know--and have others know--about our possible destiny? There is more than we can imagine at stake. 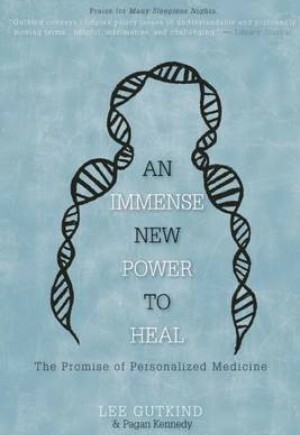 In "An Immense New Power to Heal," authors Lee Gutkind and Pagan Kennedy delve into the personal side of personalized medicine and offer the physician's perspective and the patient's experience through intimate narratives and case studies. They also offer an intriguing background of the personalized medicine movement including the fascinating personalities of the key scientists involved as well as a glimpse into the in-fighting that accompanies any race for a scientific breakthrough. The result is a highly engaging, lively, and provocative discussion about this revolution in health care, and most importantly, what it really means for patients now and in the future.